It seems my streak of success with Vogue designer patterns may have hit a snag recently. 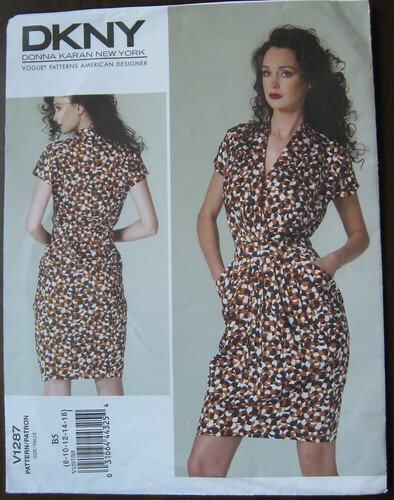 My latest selection was Vogue 1287, a DKNY dress pattern that may be a bit too much dress for me. If I could magically grow to 5' 8" it might be just right, but on my 5'3" frame plus the oversize nature of the design it makes me feel like I am wearing a sack. Here is a look at me wearing the dress, this photo was taken in a big rush by Karen, my sewing student, as we were racing out the door to meet our fellow sewists. Once again my shoe selection is not what what the outfit calls for, so it looks a bit goofy with my thong sandals, which I changed 5 minutes later. On their version the skirt is much more narrow, so I wish I had sized down from my usual size 12 in Vogue patterns, although mine looks more like their line drawing. Dress form photos. Note this is not a custom dress form, I bought it at a yard sale for $ 40 and I use it for photos and to hang projects on whilst they are in progress. So it is not my shape - but it is not that far off. You can see there is a lot of extra fabric in the waist and in back. I was a bit concerned that the hips might be too tight, so I can't exactly recall but I may have graded up to a size 14 in the hips. Mistake ! Way too much fabric around the waist and hips. I did do a couple of "after the fact" alterations on this. Once I had it put together, the waist seemed too low, there was a lot of fabric bunching up around the waist, so I took it up at the shoulders a good inch. I took it in at the bodice side seams about 1" each side, however the waistband and elastic was already in, so no alteration on the skirt. This is one of those patterns that don't permit a lot of alteration once assembled. I think the back, with that elasticated waistband is not the most lovely, so I did wear it with a belt as you can see in the first photo. I think it would help if I stand up straight too! This whole process has confirmed a thought I have had lately, that I should shift to a size 10 and then do alterations for everything below the shoulders. Sounds like a lot of work, huh? And this is not really the dress to confirm a theory like that, as it has so much fit and design ease. But next fitted dress, I will see how that works for me. I find the neckline is too wide on a lot of styles. All this is a long way of saying my love/hate relationship with knits continues! This weekend it is back to some nice, well behaved wovens. I am halfway through some pants (future posts will be about recent thrilling advances in pants-making around here) and I have a remnant of cotton lawn that is perfect for a summer blouse. Need more separates! Step away from the dress patterns! Stop talking to myself with exclamation points! If you are in the San Francisco bay area on June 23 please check out my previous post. I am getting lots of e-mails so we are going to have a great group to meetup and visit the Gaultier exhibit at the DeYoung museum in Golden Gate Park. Here is today's SunnyGal garden photo, a purple pansy to go with my purple dress. Nothing special about a purple pansy? The other day I was walking by the flower bed, looked down and saw this gigantic lavender-ish pansy. All the other pansies are white. It is twice as big and definitely a different color. Interesting. 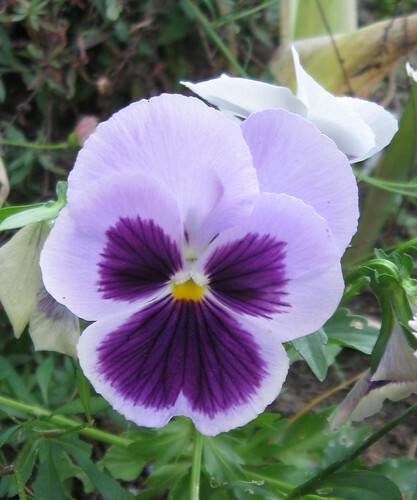 . .
Beth, the pansy is the same color as your dress! I love the dress on you, and as I am 5'1"...I can say I'd wear heels with it too. It seems that the sample may have been made up in a lighter knit and hangs a bit closer. I love your dress. It looks as beautiful as the flower. Your dress is beautiful I love the colour. It's a very pretty dress. I would love to see it lengthened to the floor. The color is stunning. The color is great and the belt is flattering too. I agree with your assessment that going down to a 10 would fit better, but it really looks great overall! The picture shows a flattering style for you. But I know from my own style issues the dress has to "feel" good on. I think you look great. The belt and some heels will give you some great wear out of this dress. 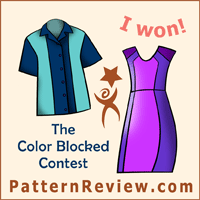 You are correct- the line drawing does more accurately represent the design ease, but still a beautiful color and a nice dress. I like you in this dress! 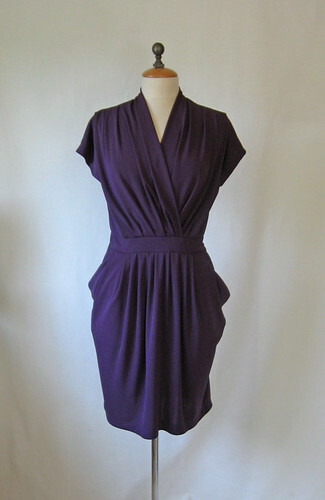 The color, style, and drape are pretty on you. I was a little leary about the pattern but seeing you in it has convinced me to buy it (wink). Thanks for the detailed review - I have this pattern but needed some guidance about what size to cut. I think yours looks great in the end! I think this dress looks really lovely on you - I think all it needs is a different pair of shoes, as you said! I think this is terrific on you. I've had this pattern on my wish list, now I'm definitely going to buy it. I think the draping and the pockets are very fun. This is one you're going to get more compliments than you expect, it's really pretty. 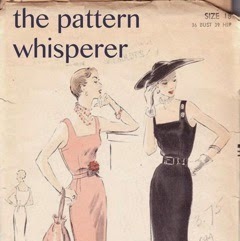 I like your dress and loved reading what you have to say about Vogue patterns as they are the ones I seem to buy most and I have had some real hit and misses of late. I have made the 1159 as well, the pattern instructions really confused me but that could also be because it was hard to see the markings on the fabric I used and so I wasn't 100% sure on the placement/instructions for the lining so I ended up not using a lining and mucked around with the draping instead but I think the dress sits a little funny. I don't know how to grade or change patterns around that much but I often wonder if I should be making them in another size. I think the dress looks more fabulous than you think! And that yes, the shoes are the only thing letting you down. With heels I'm sure it looks magnificent! I think the dress looks great on you. Its shape complements your figure and the color is fab. It looks rich and detailed. Wear it and enjoy! 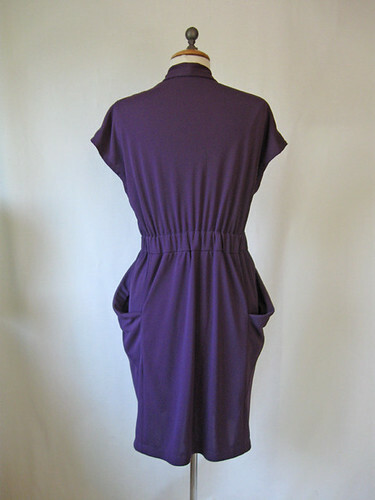 Thanks for the review on this dress...it was in my que for making and now it may wait a while! I was worried about this one and it appears for good reason too! I love this dress and think its fab on you. Maybe it just needs to be a bit more narrow towards the hem! I'm thinking of making this from a non jersey fabric. Do you think it'll work with all the ease that's already in there? Sewaholic Thurlow Pants Pattern - I recommend!